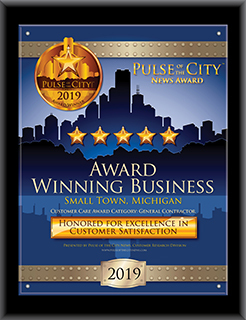 The Pulse of the City Customer Satisfaction Award honors those companies that have earned top ratings for customer satisfaction. Effectively promoting this honor contributes to the development of a brand of excellence that attracts new business, keeps customers coming back, and motivates staff and management. You know that winning customer loyalty begins with top-level products and services. You also need to show your customers their importance by demonstrating appreciation and expressing thanks. This should be done in each interaction. But do you reach every customer? Are there special customers or sources that you should individually reach? Is there anything you can do that is a tad beyond your usual routine to recognize and thank them? Do you sometimes assume your customers' loyalty? Even though you don't mean to do so, it easily happens with the press of daily business. You can bet that your competition is pitching them every day! It is two acts of faith every time a customer comes back — faith that your services are still great compared to the competition, and faith that they are still important to you. Your Pulse award status is a great way to reinforce both faiths! First, it affirms to them that your service is indeed top drawer (if you let them know about it through one of our marketing package options). Second, you can also tell all customers that you are mindful of their central role in your success with a general Certificate of Appreciation mounted for display. For a more targeted impact with a major support, as a Pulse of the City News Customer Satisfaction Award Winner, you can order a customized Certificate of Appreciation with the particular recipient's info and yours, and any special message you want. Customers have spoken about their positive experiences with your company. They played a role in your award, so take the time to acknowledge this and thank them. Customers want a reason to choose your company again. Feeling appreciated will do just that. Place the award images on your website, social media sites, emails and newsletters to remind customers they have chosen the best. We congratulate you on your high customer satisfaction rating and encourage you to browse our site to learn the many ways the award can help your company.